Finally on the blog this week, a rare mid-thirties political broadcast. This was a special program carried on CBS from the Dayton Biltmore Hotel in Dayton, Ohio, where the Fraternal Order of Eagles was having its annual convention. George F. Douglas, from Philadelphia, the Grand Worthy President of the Eagles, introduces a speech by Frank. E. Hering, editor of the “Eagles” magazine. The Eagles is a fraternity that was founded in 1898 by a group of theater owners and became known for consisting of individuals involved in the performing arts. They helped the establishment of Mother’s Day and were instrumental in organizing in support of Social Security. Hering uses his time to outline the organization’s previous support for legislation to support widows, the poor and unemployed in times of economic crisis. He goes on to urge Congress to pass what he calls the “Ludlow Eagles” bill, which would allow workers to have a sufficient wage to save for their future. Social Security was working its way through Congress at this time, but I’ve been unable to determine with certainty if Hering is calling for the passage of the Social Security Act or another piece of New Deal legislation. Anyone out there that’s more familiar with what was going on in Congress in August 1935 have an opinion on this? 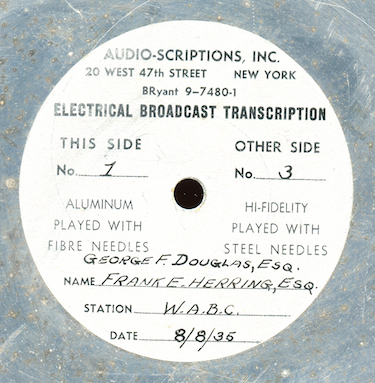 This recording is an air check of WABC, New York. The transcription begins and ends with a time check and id from the station and includes the CBS network id. There's a short piano fill at the end of the broadcast that made me think I was listening to the "War of the Worlds" for a moment. Our mp3 was transferred direct from four sides of two 12” Audio-Scriptions, Inc. uncoated aluminum discs running at 78 rpm. Hering's name is misspelled on the disc labels, by the way. The first part is in rough shape with a few skips - it was difficult to get it to play because it was scratched and heavily abused. The remaining parts sound much better. This appears to be a previously lost program. With the swearing in of a new President (apparently) happening this week, I thought we’d get a little political on the blog with some different transcriptions in my collection dealing with various facets of the Franklin D. Roosevelt administration. First up, an episode of a government radio series that appears to be previously lost promoting the Federal Housing Administration. The FHA was established as part of the National Housing Act of 1934; I’m guessing this show dates from 1934 or ’35 as the agency was trying to first promote their services. This was typical of the type of promotional radio work done by FDR’s New Deal agencies; many of the individual shows and series were simply discarded since they served a temporary purpose and don’t survive today. The FHA has seen many changes over the years. The original idea of commercial banks making loans in their own community, with the loans being backed by the Federal government, was, in my opinion, a sound idea. The breakdown of regulations over commercial banking led to the 2007 sub-prime mortgage crisis, with banks taking on loans from unqualified borrowers, buying and selling these “junk” loans on the open market, and sticking the Federal taxpayer with the bill. Despite this mix of Federal backing for loans by private local commercial banks to support affordable home ownership and stable home markets, the Republicans opposed the FHA, like many other of FDR’s New Deal programs. They got their wish to dismantle the FHA by simply passing de-regulation of banks over the years that ensured the agency would collapse with a tidy profit being earned by private commercial banks. Our FHA radio show features the United States Marine Band, Captain Taylor Branson, conducting. They perform “The Gate City March” by Weldon, as well as works by Wagner and others. We also hear a little sketch about a family needing to do some updating to their home for a long-term family visitor. They discover how a loan through their local bank, guaranteed by the Federal Housing Administration, can help them. I have another FHA transcription I’ll post later that includes short dramatized sketches about young couples buying their first home and other common situations for taking out home loans. There are no credits on the show, but the announcer sounds like the same guy who did the announcing work on 1930s episodes of “Jungle Jim”. He shows the same dramatic enthusiasm, whether he’s talking about the Marine Band and the FHA or the latest perils of Jungle Jim. 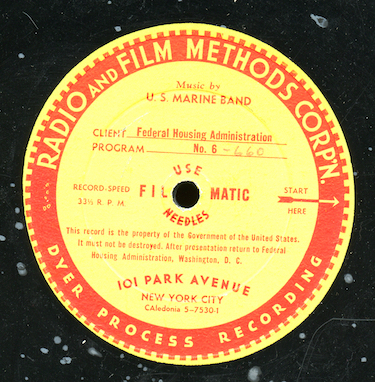 The mp3 was transferred directly from a 16” one-sided shellac transcription from Radio and Film Methods Corporation, 101 Park Avenue, New York, matrix number 206A. As far as I can tell, no other episodes of this series survives.